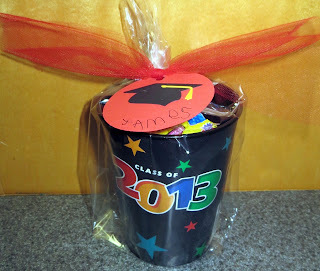 My youngest is "graduating" from preschool, so I made a little treat for the kids in his class. I found these Class of 2013 cups at Walmart and filled them with Kit-Kats, Hershey bars, suckers, gum, & Airheads. I made the tag with my Silhouette. Then, I put the cups in small clear bags and tied on the tag with red tulle. I know they will love the candy!